This has been the best kind of weekend: mellow, satisfying, and full of ideas. A weekend of coffee taken back to bed with a good book, as well as plentiful cooking, and long walks through landscape that would sit well in Wuthering Heights. I’ve had the company of my own thoughts, ideas brewing and bubbling, and the deliciousness of a Saturday night in with Nat King Cole’s voice on the record player, Katharine Hepburn’s arch tones entertaining me in her autobiography, and a glass (or two) of red wine to smooth it all out. I’ve also probably spent one too many hours on Instagram. Ah well. They’ve been fun. To top it off, I spent this evening with family friends, eating crispy potatoes and perfectly roasted chicken. We laughed and chatted and made sure that leftovers were minimal. I’m sated, in every sense of the word. I’m also knackered: the good kind of knackered that comes from tired muscles and a mind that’s been given a proper runaround. I’ve been dashing all over the place recently. I’ve talked at Trinity College Dublin's Philosophical Society about beauty standards, gone back to Oxford for a poetry reading, as well as graduation (!! ), done a shoot or two, and had many, many meetings. New things are afoot. Good things. Things I can’t wait to explore and feel my way into further. The first of those new projects was properly kick-started on Saturday, when I decided to join all the other good people with newsletters. Mine is a tinyletter called Rosalind Reads, and - of course! - it’s all about books. You can sign up for it here if you fancy a weekly(ish) reading list, arranged by theme. Expect selections of books in areas from clothes to walking to illness. The first one – Telling Tales - went out yesterday. This feels like a very natural step, and a very fertile one too. I can’t wait to get stuck in. Alongside the various ways in which I’m looking forward, if we’re talking all things words, I also want to pause here to glance back over my shoulder too. The jump from student to freelance writer has been pretty seamless. I have the time – the time! the time! such sweet time! – to pursue things I’d been pondering on and letting percolate for months and months. Some of these are journalistic. Others are longer form. But while those are in progress, I wanted to collate together the work I completed over the last few months. Some are very personal pieces, including this set of reflections for The Debrief on the bittersweet summer after university, and this essay for Buzzfeed on scoliosis, puberty, and curves in all the wrong places. Both were a joy to work on (with brilliant editors too). In print, you can currently find my words in Suitcase, where I explored one of my favourite activities: wild swimming. And in the latest issue of Violet I interviewed the brilliant director and screenwriter Sarah Kernochan about Hollywood, sexism, and what it was like to be the first woman to wear a tux to the Oscars. I’ve also (unsurprisingly) spent a lot of time writing about all things teenage. Alongside the For Books’ Sake piece looking at representations of young women in fiction, I also had the best fun writing this for the ever-ace ThandieKay in praise of free make-up samples and the power of playing with your appearance during adolescence. I talked about my teen style icons for Into The Fold, praised Hermione and smart women for Mugglenet, discussed the art of self-confidence on Howling Reviews, and dismissed any suggestion of there being a ‘universal’ teen experience for Maximum Pop. Perhaps my absolute favourite though was this piece for Refinery29. It’s called A Brief History of Men Moaning About Women’s Clothes, and oh the fun I had! It contains modernist misogynists, medieval preachers, and kings pissed off at red lipstick. Also, it featured on Man Repeller, which basically made my month. As with the work I’ve done for Broadly, this is the kind of writing I absolutely relish. Getting my teeth into an idea like this, with plenty of research required (me? Missing uni? Well, maybe only a little) and the chance to analyse clothes and culture - well, it’s the dream. I hope there’s plenty more of that ahead. 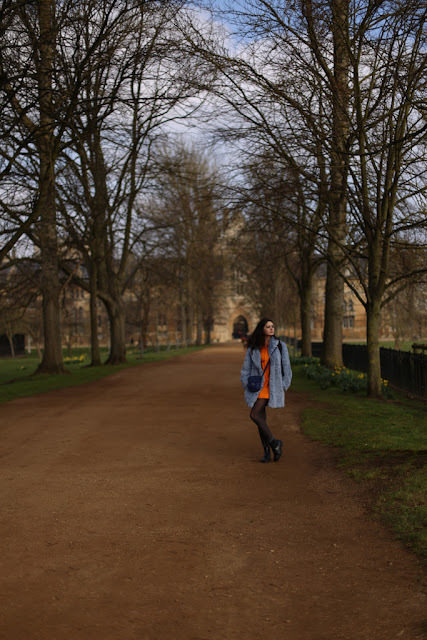 These images were taken by my dad In Oxford the weekend before I handed in my dissertation, back in March. It was a rather fraught 48 hours, but I got there – and spent the rest of the day after hand-in elated and bone-tired, lying in bed by myself drinking buck’s fizz and watching Endeavour. About as perfect as it gets. That whole year is already receding into the distance astonishingly quickly. My dress is from Stockholm's Beyond Retro, and the boots are second hand. I'd forgotten about these photos until the other day when I pulled this greyish-blue beauty of a coat back out of storage. I bought it from my all time favourite place for vintage in Oxford: Charlie's stall at the Gloucester Green market (he is the most excellent man - the ritual of visiting his stall is worth a whole blog post of its own). I ummed and aahed over it at first, and he, fabulously, told me to take it home, give it a test run, and give him the money the week after if I wanted to keep it. By the time I'd walked home enveloped in fluff, I knew it had to be mine. It’s ridiculously warm, ridiculously joyous, with the bonus of making me feel like a stately teddy bear with a blue rinse. The weather is now cold enough to shrug it on once more. I think it'll be perfect for some of those long, rambling walks. That does sound like a perfect weekend! And you've been very productive with all those articles!!! I wish I could say the same for my career, haha. Firstly, congratulation on finishing university. Well done. You've certainly been busy yourself, and have many feats to be proud. I'm particularly admiring your Refinery piece--enjoyable to read, full of great linkings, and wonderment. You look absoluty fabulous! That coat is gorgeous, gorgeous, gorgeous...and the photos are filled with good vibes that are not only due to sunshine. Simply wonderful. How nice your wrote about wild swimming, I know you enjoy it...there is nothing quite like it, right? It's like being literally immersed in nature, that's what it feels like. It was lovely to read that article about your and your friends experiences/feelings after graduating. I think you captured it very well. I also enjoyed your article for Buzzfeed. There are lots of reponses to it, people telling their own personal experience, stories and struggles with scoliosis, a great reminder why this theme is still relevant and worth talking/writing about. Isn't it ironic that Moretti of all people should have written that? I mean the futurists were all about the material progress, weren't they? With that airplane's are new artworks attitude and so on, yet he blames women for wanting to look nice and up to date. I suppose he reserved his futurism and moderism for man...terribly disappointing passage by mr. Moretti, but I think you got him right, he was probably upset because of some kind female rejection and had the need to critize all women (as men often do it this state). Why it never occurs to them that women refuse to date some men just because they're ill tempered, rude or creppy? So cool you were featured on Men Repeller.